Mothers in Barbados want to know if any Chinese milk products have been imported into Barbados recently or at any time in the past, but the Barbados news media – both print and broadcast – remain silent. The world’s news media has been in a feeding frenzy for three days over the latest contaminated food scandal from China. Hundreds, perhaps thousands of babies are seriously ill due to contaminated baby formula and milk products from China. At least one child is dead, maybe more if you don’t trust the Chinese to tell the truth… and we don’t. News reports indicate that the Chinese manufacturer and government knew of the contamination weeks ago but in typical fashion failed to recall the product and alert the world. The melamine-contaminated milk products have also been exported to at least one country outside of China for processing into products that will not bear the “Made In China” label. I guess it is payback time for all those free trips to China enjoyed by Barbados “journalists” as guests of the communist government. August 14, 2008 – Hartley Henry Pays The Chinese Back For That Free Trip! July 6, 2008 – Pet Kidney Failures: Tainted Pet Food Still Killing Pets In Barbados? July 6, 2008 – Keltruth Blog: Did your pet die suddenly from kidney failure? Tainted petfood could be the cause. May 15, 2008 – Journalist Peter Wickham Says Nation News Removed Section On China Human Rights Violations From His Article! April 23, 2008 – Which Barbados Journalists Have Received Gifts and Trips From Communist China? In this case I agree. What did you expect after the free trips to China? It is time that we give our mother’s up to a year’s maternity leave so that they can breast feed their babies and not have to worry about imported nastiness. Since 1967 we have been giving mother’s 12 weeks maternity leave. Much has changed since then but yet we are still at the same old, same old. Is anybody surprised that we have more and more asthmatics. TO HELL with Barbados reporters who took the China freebie and don’t report this story. I want to hear from the Minister of Health right now. This has been going for three days. Bet this story will be in the mainstream news in a week. We should have a health news section on this blog. I notice Canadian Brand food products are sold in Barbados. What if these products were sold in Barbados? Tell us the Brand of formula you are giving your daughter and we will find out if it is tainted or not. 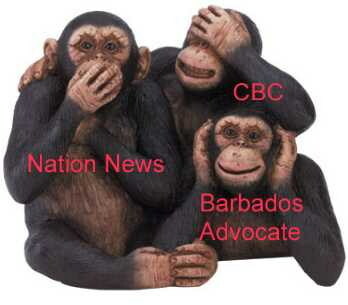 Carl Moore must be apoplectic over the monkey label given to the press in Barbados. The Barbados government seems to have gone to bed with the chinese, therefore they have to keep their mouths shut. Check construction, they are doing most of the projects, even during the last administration and the chinese government is financing a lot of projects, many are in the pipe line to start soon. They are tendering as much as 40% below the nearest competitor because of wages paid to their chinese employees. All this seem to have the government,s hands tyed to the detriment of bajans. The FDA has warned that this tainted infant formula from China may be on sale at ethnic groceries in the USA (see link on my blog). Could it have reached Barbados? Uh Uh Duh . I dont know which paper Bfp reads, but its in todays Saturday sun on page 12.Highlighted in yellow. Talk about jumping the gun. Irresponsible “journalism” on your part. Accusation without evidence puts you on the same level as the National Enquirer. You’ve done better, and you should do better. The nation covered this story on saturday? Its about time! I agree with BFP they should have published it earlier. Why are blogs able to break a story before the newspapers? It shouldn’t happen and it happens at least once a week in Barbados. Cheesecutter, I’m happy to hear that the Nation reads the Free Press and is finally covering this story. Did the Nation interview the Minister of Health? David, I submitted a post yesterday and has not been posted. You guys heard from StarCom network news about this issue from the Radio? The Scout got it wrong. When unemployment in this country was 26.2 per cent the then DLP had Barbadians on the breadline and Chinese working. How can this DLP Government be firm with China when it went there recenly with its begging bowl.